After finishing a teaching degree, Deb went to Africa where she was caught in a desert sandstorm, harassed by monkeys and thrown in jail…twice! 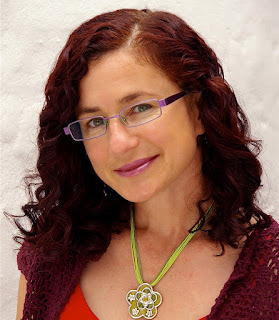 She produced and wrote a national kids’ TV show before leaving to write over 20 novels, including Max Remy Superspy, Jasper Zammit (Soccer Legend) and New City, the sequel to the bestselling, Grimsdon, about kids living in a climate-changed world. Teresa A New Australian, was inspired by her dad, who, with a million other refugees, made the journey to Australia after the devastation of WW2. Her latest book, is The Stupendously Spectacular Spelling Bee. Deb’s won awards for her books and is a proud ambassador for Room to Read and Books In Homes. Teresa was only four years old when the bombs began to fall. Over the next three years her island home of Malta became the most heavily bombed place of WW2. 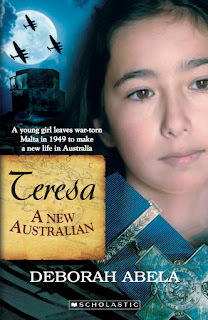 With her country destroyed and starvation rife, Teresa’s father decides to leave for Australia, to its promise of jobs, wealth and a brighter future. Despite very few possessions, little money and outbursts of racism, Teresa and her family work very hard to make Australia their new home. Very few kids I speak to in Australia are aware of this important part of Maltese/Australian history, but when they hear about it, they are fascinated. The bravery of the Maltese in defending their country against the Germans is such an important part of the success of the allies in WW2 and the resulting migration to Australia helped create the strong nation it is today. I’ve spoken to kids both in Australia and Malta. Australian kids are fascinated by the Maltese history and Maltese kids are fascinated about what happened to the migrants when they arrived in Australia. This feels like a lovely coming together of both nation’s histories. I spoke to many Maltese who lived through the devastation of the war and who made the journey to Australia to start a new life. I discovered many heartbreaking stories of families who lost loved ones, because of the bombings but also due to starvation because not only was Malta bombed but so were the supply ships from Britain that were bringing supplies to feed the Maltese population. I was fascinated by the tunnels the Maltese built by hand and used to hide from the German bombings for 3 whole years. I visited some of these tunnels in 2016 and it was hard to imagine whole families living underground in these dank, dark places for so long. It must have been terrifying, but emerging after the raids must have had its own terror, as the Maltese discovered the wreckage that was left behind after each raid.